Deborah Stratman (b. 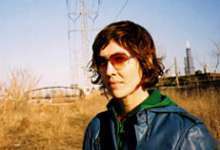 1967) is a Chicago-based artist and filmmaker whose work plies the territory between experimental and documentary genres. Her films and frequent work in other media, including photography, sound, drawing and sculpture often explore the history, uses, mythologies and control of highly varied landscapes: from Muslim Xinjiang China, to rural Iceland, to gated suburban California. She recently completed trilogy of works that collectively address concepts of the paranormal in the information age, and is currently working on a film about "freedom" which ruminates upon elevated threat, patriotism, wilderness and the possibility of personal transcendence. Stratman teaches in the School of Art & Design at the University of Illinois at Chicago.